While i was reading this edited post for publishing it yesterday (June 29, 2011), i was reminded of my latest experience which i had been through. In one of the posts, i had mentioned that i am pursuing a computer course of advanced graphics and web-designing which would make me more efficient in blog work. Never i was knowing that Lord Sai Baba had a very different plan for me. Being post graduate in business administration, my family members wanted me to do job. I was reluctant to take up any because i felt in such case i would not be able to cope with Lord Baba's work which has always been my priority. Sorry for writing lengthy introduction. Let's now see experience of an anonymous Sai devotee. Anonymous Devotee from India says: I am sharing you my experience with Shirdi Sai Baba. How He has been always with me in tough times and how He blessed me for my good deeds. PLEASE DO NOT DISCLOSE MY NAME AND MAIL ID. Today I am sharing my experience with you all. I started worshiping Sai Baba from early 2009 onwards. At the same time, I got admission for post graduation, which started in July 2009. Before this I was really disappointed as I resigned from my first two jobs and that too within two months of my joining. All this happened before I met Sai Baba. And when I started worshiping Sai Baba, I got confidence in myself and got a direction to walk in my life. As time passed by, my belief in Sai Baba grew stronger. I daily used to worship Baba and used to read Shri Sai Satcharitra regularly. I still can’t believe that I got selected in a very good company for my summer internship and got the highest stipend as a summer trainee in campus. For final placements too, I had full faith in Baba. But somehow couldn’t get selected in the same company in which I did my internship. Still I prayed to Baba with full Shradha and Saburi. And it so happened, that almost everyone was getting placed in the college. With this the last day of placements came and we were told that no more companies will be visiting the campus and from next day onwards we will have to visit the companies office for interviews. I was very much tensed but had full faith in Baba. There was one company on last day, which I was looking forward for and registered for the same earlier. The last day arrived and I appeared for the group discussion. It was very good. After getting shortlisted, I appeared for the personal interview. But I was really not satisfied with my performance. I was sad for this. Till that time I continuously prayed Sai Baba for helping me in these tough times. Finally results were to be announced on the same day; even though I was not expecting my name, I still went to the results room. The HR came and started announcing the names. At the same time, I was carrying Shri Sai Satcharitra in my bag and I kept it holding while the names were being announced. Suddenly, my name was announced and I was really surprised. I kept holding Shri Sai Satcharitra with my hand in bag and just couldn’t believe that I got placed in such a good company. On top of that I had my best friends with me to share that moment. I couldn't stop myself crying, and couldn't speak anything. I thanked Baba that moment. All this happened just because of Him. Before our placements began I had a MANNAT (wish) in my mind that I will feed poor, when I will get placed. So now it was my time to fulfill my vow. I went to Sai temple in our city and there are many poor people who sit outside the temple. I went to a nearby shop to purchase some food for the poor. While the shopkeeper was weighing the food items on weight balance, I saw a Sai Baba picture on the balance. This gave me immense happiness that Sai Baba is blessing me for this. Immediately I saw an old village man wearing white kurta, dhoti and turban standing next to me. He looked to me and smiled at me and then He kept His hand on my head as if He is blessing me for this. I was really shocked to see this happening. I thought how come that old man knows that I was purchasing food for poor. But I was really happy that Baba gave me blessings at that time. After that I went to the temple distributed the food and came back happily. Wow! Amazing experiences shared above. So wonderful are Saibaba's leelas. I bow to your feet ShriSai. Please bless all your devotees. thank you for sharing my experience . you will not believe how much happy i am right now..tears are rolling down my eyes even while writing this. just two days before,when i went to sleep i was not feeling well because of some circumstances in life. 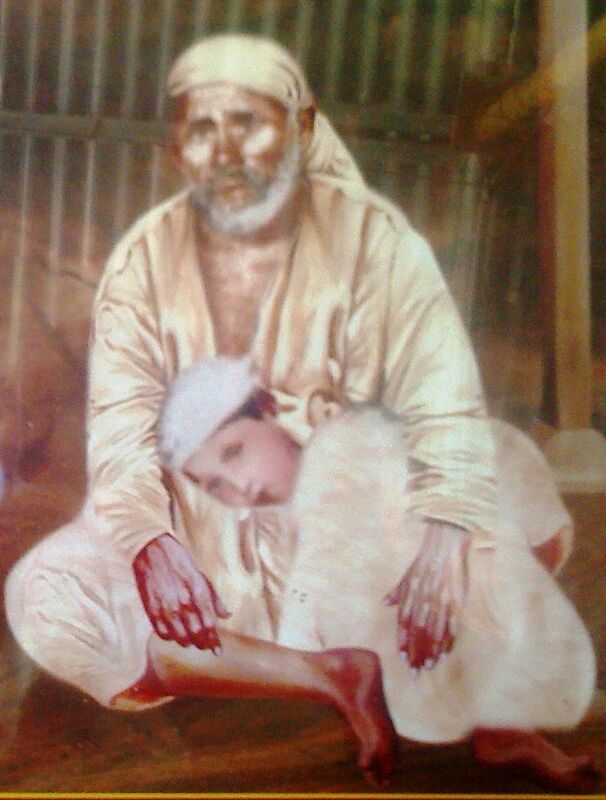 i prayed to baba to keep me in his sharan and under his lotus feet always and while imagining myself sleeping in the lap of baba jee i went to sleep...and since then i was imagining the same everytime and getting baba jees blessings. really baba jees leelas are great .. Very delightful experiences..Om Sai Ram!!!! You are blessed by Sai Hetalji. I wish Sai to bless me with a job. Akhanda Koti Brahmanda Nayaka Rajadhi Raja Yogi Raja Parabrahma Sri Sachidananda Samartha Sadguru Sainath Maharaj Ki Jai. I was happy to know that you have found a very good job with Baba's blessings! Congratulations and the all the very best! I believe that you are Inspired by Lord Shri Shirdi Sai Baba. Baba’s Greatest Blessings for us - " HIS TEACHING’s "
Our Greatest Dakshina for Baba - " TO SIMPLY FOLLOW THEM ". I also bow our beloved sai baba.May god bless u all. Congratulations Hetal ji... and have a lot of such wonderful moments ahead. OM SAI RAM OM SAI RAM OM SAI RAM OM SAI RAM OM SAI RAM!!! Congrats Hetal ji for your new job. BAba I'm doing NAvaGuruvar Vrat for my husband. Please help me baba. U has shown me direction. U show the direction to him also. Create love and affection in him as he is missing. Make both of us understand each other and Love each other.